Most parents fall in love long before their baby draws its first breath. Lives are inexplicably intertwined whether they have a lifetime or mere minutes together. “It’s one of the most challenging and rewarding things I’ve done,” said 36-year veteran nurse Martha Hill, RNC-OB, nursing unit supervisor for the Maternal Fetal Medicine Unit at Mission Hospital. Hill cares for moms and families grieving the loss of their babies. “Each moment we can give them with their baby is precious and priceless,” said Hill. A year ago, Mission Hospital received a generous gift from Jim and Catherine Ashe from Candler. 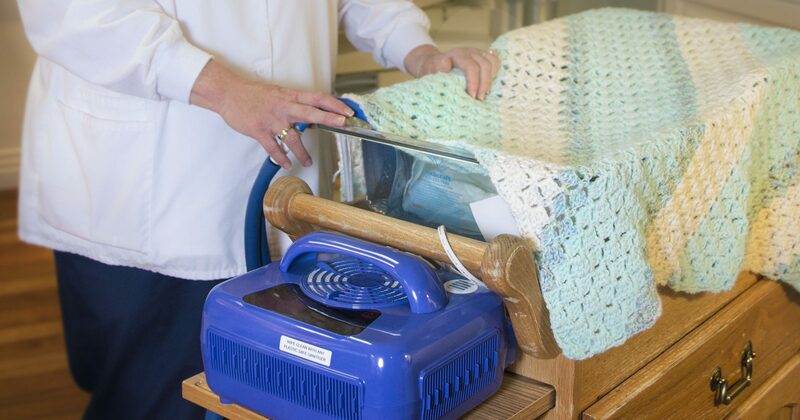 Following their son’s death at five months old, the couple donated a special cooling bassinette known as a cuddle cot, which makes it possible for bereaved families in the hospital to keep their babies with them in the room. The Ashes know firsthand what a cuddle cot can mean. When their son, James, was born, they didn’t know how much time they’d have with him. Baby James had been diagnosed with a genetic disorder that cuts short babies’ lives, and the hospital didn’t have a cuddle cot at the time. “Having one there would have eased the fear of having to let his body go before we were ready,” said Catherine. “Since we were with him every minute of his life, it seemed unnatural to be separated just after he died.” Using a cuddle cot from a nearby center, the family was able to say said goodbye to James in their home. The Ashes are honoring James’ memory by doing this for others. About one family each week gets to know their baby in the hospital before saying goodbye thanks to the Ashes. Martha Hill, RNC-OB, is nursing unit supervisor for the Maternal Fetal Medicine Unit at Mission Hospital. Learn more about Women’s Services at Mission Health at missionhealth.org/womens .